EIB installation consists of sensors and actuators. The E.I.B. concept allows intergration of Building Management Systems (B.M.S.) over one common system. Lighting, blinds, heating and ventilation can be automatically controlled through the E.I.B cable. 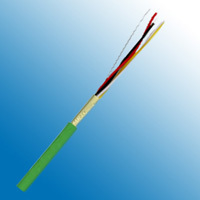 This dramatically reduces the cabling required in a modern building. To meet European standards this cable is LSHF throughout. They can be installed over, in, or below the plaster, in pipes and pipe ducts, in dry, moist, and wet areas, as well as outside, provided they are protected against direct exposure to the sun.